The ancient ruins of Petra is what the middle eastern country of Jordan is primarily known for. And it is freaking incredible, but there was also an unexpected treasure, a place of tranquility and boundless empty spaces. A place that is a great addition to my list of the top things to do before you die. Wadi Rum is 720 square kilometers of heart stopping desert landscape, where a maze of sheer-sided sandstone and granite monoliths rise up from the valley floor. Its dramatic panoramic land is where you can follow the footsteps of Lawrence of Arabia, ride camels through the sun-kissed desert and be amongst the semi-nomadic Bedouin people who still live in the area. Driving down the seemingly endless dusty road into the largest wadi in the country of Jordan it was easy to see why it was the filming location for The Martian, a movie set on Mars. Also known as The Valley of the Moon, it was dry and desolate. Layered in countless shades of beige and desert red. We needed a better-equipped vehicle. Luckily, we showed up just in time for lunch, so before heading out we loaded our plates with traditional Jordanian food at their long buffet. 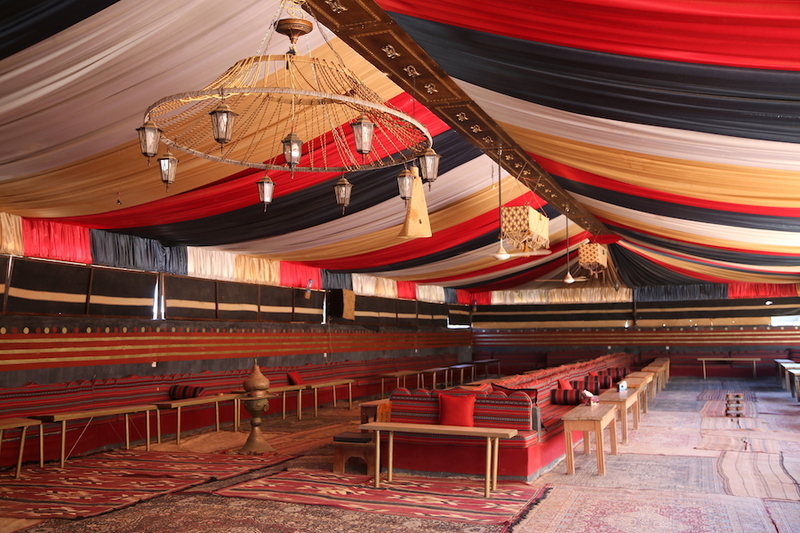 A large, colorful pitched-tent lined with oriental carpets and cushioned bench seating was the dining room. As we snacked on dishes like fattoush, an older male Bedouin musician was perched on a short stage playing the oud, an oriental instrument similar to the mandolin. After lunch, three old Toyota 4×4 pickup trucks, fitted with benches in the open-air bed, were waiting for us. We were going on a five-hour desert safari through this UNESCO World Heritage site, heading further into the landscape to explore, before being dropped off at our barracks for the night. Though riding inside the cab was an option, I hopped into the back wanting to feel the wind in my hair and the sun on my face. We began driving, a cloud of dust trailing behind us. The aroma of sage, cardamom and cinnamon permeated the tent at our first stop for a cup of Bedouin tea. It was the teashop like no other, nestled between the rocks with a sand dune view from the seats inside. Tea is an important ritual for the Bedouins; there is never a wrong time for a cup, this includes in the middle of the desert. Saying no to this liquid generosity is just plain rude. Next the trucks brought us to what appeared to be in the middle of nothingness, where a dozen camels laid resting on the warm sand making chewing motions and showing their large yellowed teeth. It was a camel spectacle. But that wasn’t why we were here; it was for the inscriptions that were carved into the rocks that lay directly across from the herd of chomping animals. These petroglyphs depicted people, footprints and animals dating back to prehistoric times. The over 35,000 chiseled images and inscriptions dotted throughout the desert tell 12,000 years of stories about the people that have inhabited Wadi Rum, including the Nabataeans. Dunes were common in the valley, but none as impressive as the expansive Al-Hasany red sand dunes that back up to Jebel Umm Ulaydiyya. Here the drivers put the trucks in park at the base of one of the tallest slopes claiming it had the best view from the peak. There was only one way to find out, and it involved a steep climb. Let’s climb a sand dune. We took off our shoes, sinking our feet into the soft sand and ascended to the summit. Once at the top, some of us sat cross-legged taking in the natural beauty of our surroundings, while others tried to capture the best jumping shots with a sea of sand as the background. As evening fell, the last stop we made was in what seemed like the middle of Wadi Rum. This is where we abandoned our trucks since from here it was only a short walk to the camp. But before heading that direction, we all sat quietly on the valley floor waiting for a performance of another kind. Nobody said a word as the sun began to set over the rocks, lighting up the desert in a flurry of color. After five hours of exploration we ended up at a private camp deep in the desert. Entering through a candlelit walkway, there were about twenty individual tents that surrounded a central courtyard. This patio had a campfire that was already blazing when we arrived. Comfortable and colorful cushions surrounded the fire pit, a place where we convened after dropping our belongings off in our individual tents. Our dinner had started to be prepared well before we arrived. With a cooking time of four hours, it had to be. The Bedouin staff were honoring us with a special feast, a zarb, an ancient and traditional cooking practice that is done underground. After our casual dinner we sat back around the fire for some authentic entertainment that did not include a television or the Internet. Lively Bedouin tribe music began to be played as the natives taught us how to do the zaghrouta, a rapid ululation of a la-la-la-la sound that is used to express celebration. Trilling of the voices and clapping hands echoed through the desert. After the music had tapered down, the ones who stayed up later spent the evening stargazing at the twinkling sky, drinking Jordanian Syrah and smoking hookah. When the crackling of the fire started to dwindle and the bottle of wine was empty, I retreated to the cozy room in my goat hair tent where there was no electricity or amenities other than a full-size bed, a wooden chair and a box of candles. I lit one, and fell into a peaceful sleep where the only sounds you could hear were from the faint voices of chatter from those still awake and the flicker of the flame. I woke up the next morning well before any of the others in order to climb to the peak of an untouched sand dune and watch as the sun rose over the already picturesque landscape. Miles from the nearest town, there was complete stillness. In our normal lives random noise is the norm, but not here. There may not have been a quieter place on earth than in the wee morning hours of Wadi Rum. Back at the camp a slew of kneeling camels lined the walkway. Inside, our Jordanian guide Mohammad had set up a beauty shop of sorts on one of the benches in the dining area, where he was expertly wrapping traditional Bedouin scarves around camper’s heads. These wraps would be helpful for our last adventure, a long camel ride through the dry desert back to the main camp. I approached the humped animals, picking my favorite of the bunch; a choice specifically made by the colorful red and yellow saddle he was wearing. Holding on tight to the pommel, I boarded him as he was kneeling and he slowly stood to his feet jerking me forward. We then started on the journey back to where this experience began, following the paths that thousands had before.
. . . Check it Off Your Bucket List . . .
Jordan is a mostly Muslim country located in the Middle East, sharing its borders with Israel, Syria, Saudi Arabia and Iraq. Wadi Rum is a 720 square kilometer dramatic desert in the southwestern corner of Jordan, near the Saudi Arabian border. Its diverse landscape consists of sheer sided sandstone and granite mountains, natural arches, narrow gorges and chiseled canyons. There are regular flights from the U.S. on Jordan’s national carrier, Royal Jordanian (www.rj.com), plus several other international carriers that will fly into Queen Alia International Airport located just south of Amman. 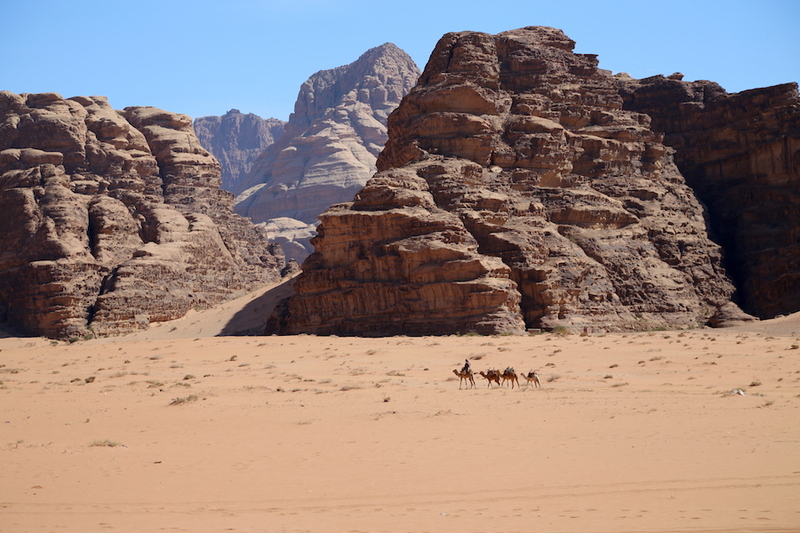 From Amman Wadi Rum is about a 3-½ hour drive, though many visitors choose stay in Petra instead, which is roughly an hour and a half away. From Amman you can take a bus to Petra, since there is no bus service that goes all the way through to Wadi Rum. A JETT (www.jett.com.jo) bus runs daily for around $14 USD and will drop you off in Petra were you could either hop on another bus or take a taxi. Your hotel (or call 079 5235257 to book a seat) can arrange a bus from Wadi Musa, the main tourist gateway to Petra, to Wadi Rum that leaves around 6:00am and costs just under $10 USD. Taxis run roughly $50 USD and many camps will be able to arrange taxi service. Viator offers a private transfer from the airport to Petra for $68.75 USD then you can take a bus or taxi to Wadi Rum from there or for roughly $200 USD AAT (www.ammanairporttransfers.com) will give you a private transfer all the way to Wadi Rum. 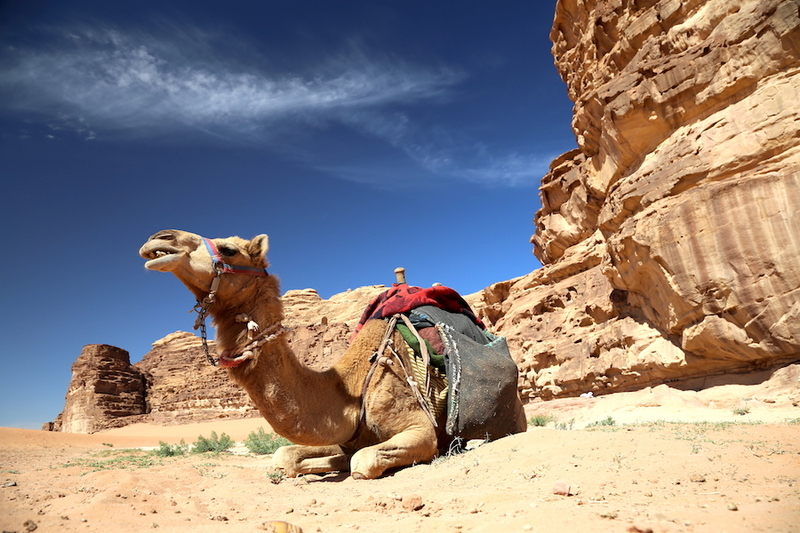 You can also get to Wadi Rum by renting a car, which can be the most flexible way to explore. The airport has numerous companies, many of which are also found in America (Dollar, Thrifty, Budget, etc. ), so do a search on a site like Expedia (www.expedia.com) or Skyscanner (www.skyscanner.com) who will compare the rates from different car rental companies. The cost starts at around $40 USD per day. The roads are in good condition and the important signage will be in English as well as Arabic, but make sure you have a good map or GPS. Unless you rent a 4WD you won’t be able to truly explore Wadi Rum in your rental, but it will get you to the visitor’s center where tour or camp guides can pick you up. Arabic is the official language. Many Jordanians in the urban cities speak English, though fewer will in the smaller villages, especially the Bedouin elders. The local currency is the Jordanian Dinar. Some places will accept American Dollars, but it is not a guaranteed so exchange some money. ATMs can easily be found in Amman (and there is one at the airport), but can be challenging in the smaller towns. Jordan travel requires Plug C / D / F / G / J, 230v. Most outlets will be the same as the European with two round prongs. You will need an adapter and a converter if your devices are not dual voltage. I used the Insten Universal Adapter with no problem. 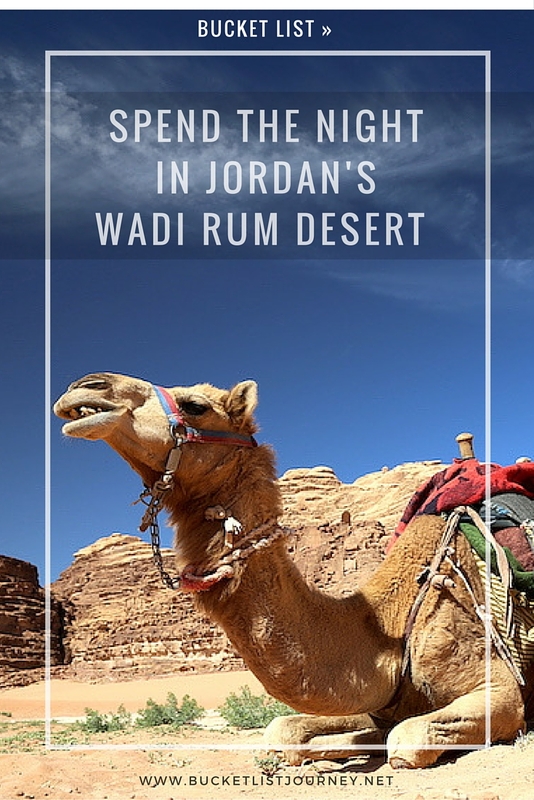 The best time to visit Wadi Rum is from March to May or late September to November when the temperatures are moderate and rainfall is at a minimum. In the summertime the temperatures can soar up to 115 degrees, which will make exploring the desert next to impossible. In the winter the daytime temperatures may be comfortable in the mid 60s, but the evenings will get down to the low 40s, which will be chilly if you are sleeping in a tent with no heater. For an overnight stay in a Bedouin tent it’s best to book online directly with the camp (see the ‘where to stay’ section for recommendations) and have them arrange any tour experiences that you may be interested in. It is also very simple to make these arrangements once you get to the Wadi Rum visitor’s center. For an easier option, Viator (www.viator.com) offers an overnight in Wadi Rum with transportation from Amman for $200 USD, though it only includes a 2-hour jeep safari. 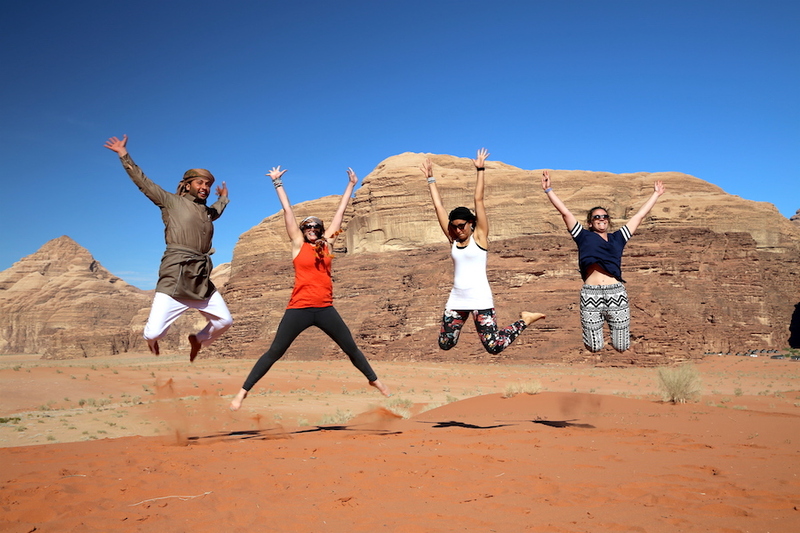 If you feel more comfortable booking with a U.S. tour operator who will plan your trip from start to finish then check the approved list on the Visit Jordan website (na.visitjordan.com). 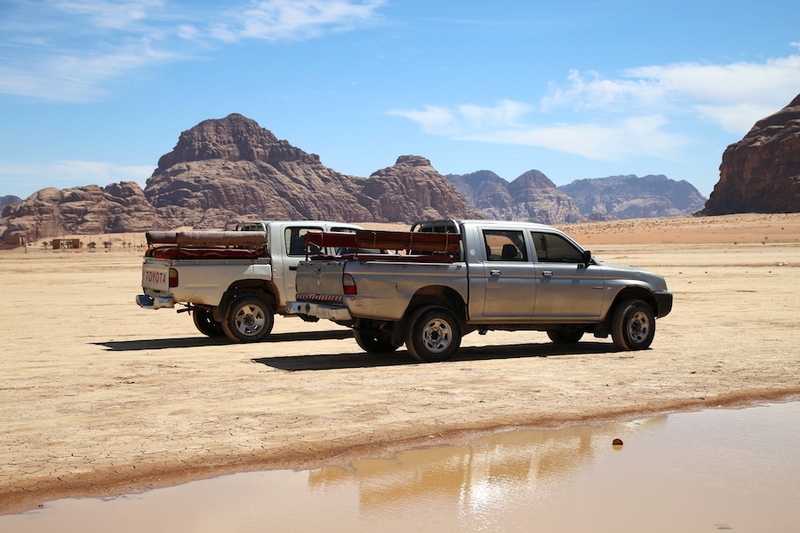 You will need a 4×4 to navigate Wadi Rum on your own, though it is best to have a Bedouin guide who knows the area accompany you. You can hire a guide at the visitor’s center who has his own truck or can hop into your rental. Otherwise most exploring of the desert is done on tours with trucks, camels, ATVs or on foot. Taxis can be arranged by your chosen camp to get you to nearby places outside of Wadi Rum, like the city of Aqaba along the Red Sea. There are several camps that offer a similar experience, glamping in a private Bedouin style tent with shared bathrooms and dinner included. 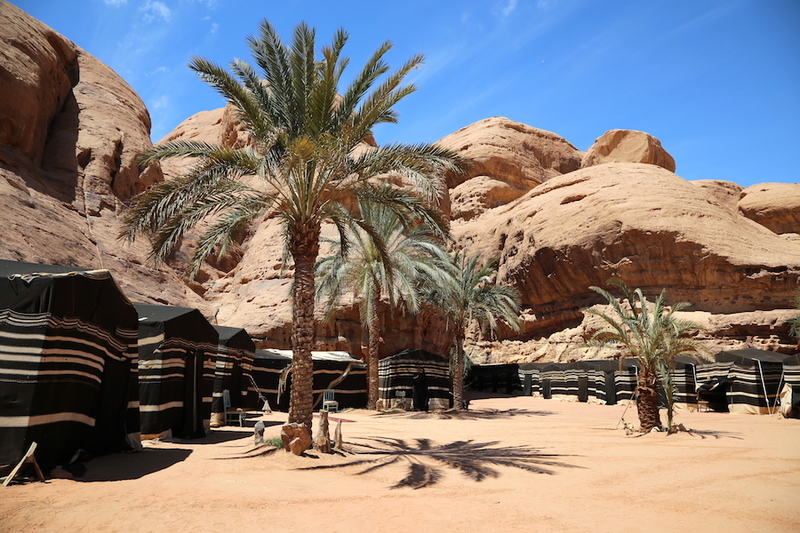 Bedouin Lifestyle Camp (from $35) is nestled beneath a rock face and run by two Bedouin brothers who want to share their culture. 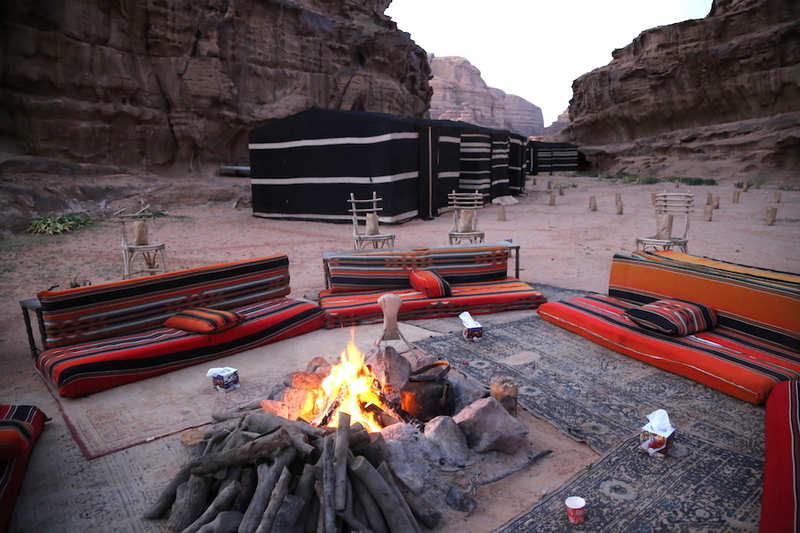 Wadi Rum Night Luxury Camp (from $112) offers a more extravagant glamping night with a private terrace, bathrobe and the finest linens. Obeid’s Bedouin Life Camp (from $71) is a small family run camp in the heart of the desert. In the private camp at Captains Desert Camp ($71) is where I spent the night surround by sandstone rocks and sand dunes. The Mövenpick Resort Petra (from $117 USD) is conveniently located right across the street from the Petra Visitor’s Center. A simpler, no-frills option is Al Rashid Hotel (from $38) in the city center who offers clean rooms and free breakfast. Petra Moon Hotel (from $70) boasts a roof terrace that overlooks the beautiful Petra Mountains. The newly renovated Sharah Mountains is a family run 3-star hotel known for its cleanliness and hospitality. Restaurant options are limited in the area, plus you will most likely be eating all meals at your chosen camp where they are typically provided in the cost. Though if you want to venture the Resthouse (tel. 962 2018867) located in Wadi Rum Village is a good choice since they serve alcoholic beverages. You can also get a decent buffet lunch or dinner here for around $15 USD. If you are staying in Petra before or after your visit, take a cooking class at Petra Kitchen (www.petrakitchen.com) and then eat your deliciously homemade Jordanian meal. Don’t want to cook your own meal? Try the traditional lamb mansaf at the low-key Reem Baladi (Mid-Town on Tourist Street; Petra – Wadi Musa; tel. 0777312455). It’s where the locals go! If you’re not that hungry, head over to TimeOut (Tourist Street, Petra – Wadi Musa; tel. 962777809432) where you can get snacks and coffee while smoking shisha. With a couple extra days in Amman don’t miss stopping by the most legendary falafel stand in town, Hashem (Al-Amir Mohammed St Downtown; tel. 96264636440). It will be challenging to snag a seat, but you won’t be disappointed even if you are eating them in the overflow alleyway. Afterwards walk a few blocks over to Habibah; Al-Bank Al-Arabi downtown branch) who specializes in freshly baked Knafeh, a cheese pastry soaked in a sweet syrup and topped with crushed pistachios. Get out of bed in the wee hours of the morning to get an unforgettable panorama of Wadi Rum in a hot air balloon. Royal Aero Sports Club (www.rascj.com ) offers a 50-60 minute birds-eye view for $182 USD. Do as Lawrence of Arabia did and ride a camel through the arid desert. Rum Stars (rumstars.com; from $98) offers multiday camel trekking, but a word of warning: going by camel is a bumpy ride, much more so than a horse. Camps will also arrange tours that can range from ten minutes to ten days. For the adventurous travelers who are not afraid of heights, stand on Burdah Bridge, the natural stone arch that sits 262 feet above the rock below. It’s a dizzying and challenging climb to the summit, but the photo op from the top is a once-in-a-lifetime. Many of the jeep safari tours make a stop here, but confirm this before booking. Strap your feet onto a board and take a wild ride down a sand dune. Sandboarding is similar to snowboarding, except if standing is too difficult it’s perfectly acceptable to sit or lie down. Many full day or more tours will include sandboarding, some of the jeep safari tours will offer a sandboarding option for an additional cost (around $14 USD). The Bedouin Lifestyle Camp (www.bedouinlifestyle.com) offers a free snowboarding option upon request with all their jeep tours. 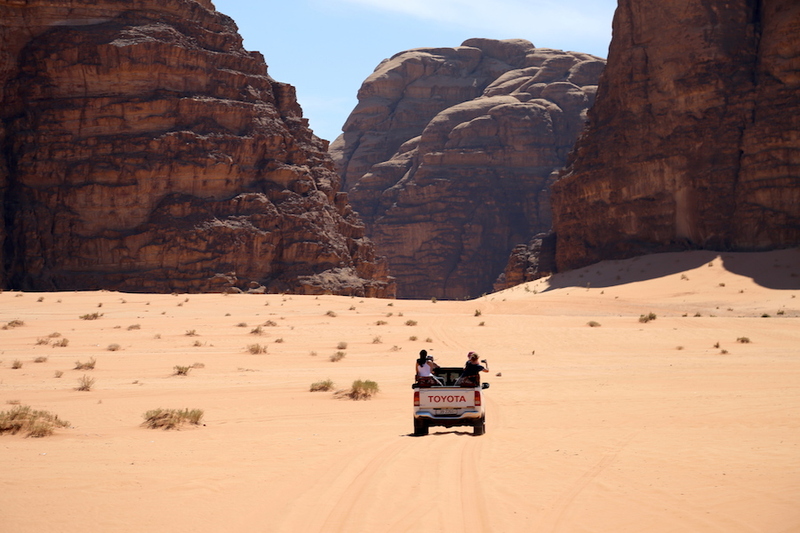 A Jeep Safari tour is the best way to see what Wadi Rum has to offer in the least amount of time. Common stops on a few hour tour can take you to Burdah Bridge, Lawrence’s Spring, Al-Hasany Dunes, Nabatean Temple, and Khazali Canyon. Most, if not all, camps will offer a jeep safari, but you can also book on at the visitor’s center for roughly $99 USD. Though, it will be more cost effective to book this tour in combination with an overnight camp stay, as discounts will be offered. Do not take any photos of the Bedouin people, especially the woman, without getting permission. The stars in Wadi Rum are unlike no other place, if you want to get photos of them be prepared with a tripod and knowing the proper settings for your camera. It’s easy to get lost in the desert, so it’s best to have a guide with you when exploring. If not, make sure to carry a compass and a map. US Citizens will need a visa, which can be purchased at the airport in Amman. A single-entry visa that is valid for up to 60 days currently costs 40 JD (about $56 USD). 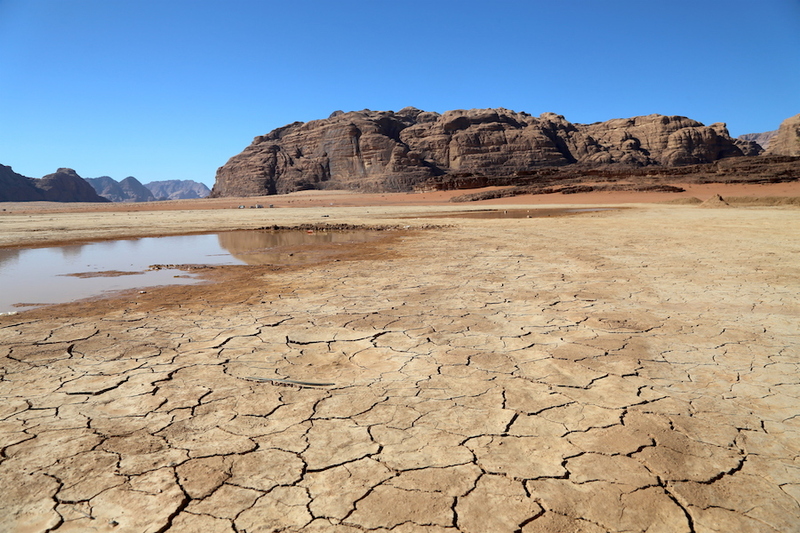 Remember that some areas in Jordan, including some Wadi rum camps, are dry (no booze will be easily available) so grab a bottle or two in Amman or Petra. Make sure to drink more water than you think you need. You are in the desert where it can be easy to get dehydrated. It doesn’t hurt to stop by the pharmacy to pick up some dehydration powder packets that can easily be put into your water in case you feel dizzy. When there is a choice, hire the Bedouin people as much as possible to support their community. Many of them are available as drivers and guides at the visitor’s center. If possible, leave your large luggage behind at your hotel. Traveling with just a backpack or duffel bag makes navigating the soft sand of Wadi Rum much easier. Wear comfortable walking shoes; light hiking shoes or sturdy sandals would work unless you plan on doing some serious climbing. A pair of Keens would be a good choice. Bring tissues, not so much for when you are at the camp but you make have to pit stop behind a tree while on the safari, plus frequently there’s no toilet paper in the restrooms throughout Jordan. A good pair of sunglasses is necessary for the dust and sun. The sand will get everywhere so bring durable clothes that blend with the reddish colored sand. Anything white will discolor quickly! It can get chilly at night, so bring layers of clothes. A long pair of warm pants and sweatshirt is a good idea. There can be some pesky mosquitos out there, load up on the bug repellant. Many camps are lit by candles or turn off their lights at a certain hour, so bring a flashlight to find your way around at night. Jordan is primarily a Muslim country where many of the women choose to cover the curves of their body, hair and/or face. Though this is strictly a choice made by the individual, not a requirement, you should still be respectful to their customs by bringing modest clothing (no skimpy shorts or tops). Loose short sleeve t-shirts, ankle-length skirts, lightweight long pants, or capri-style are acceptable. My trip to Jordan was hosted by My Jordan Journey, but all opinions are my own. I have been a desert guide for a long time as of now. I know where to locate the most excellent and noteworthy spots of Wadi Rum furthermore its insider facts. Wadi Rum is his country and he cherishes it in particular. I will answer all the inquiries that may strike a chord – about Bedouin dress, traditions, history or whatever other angle regarding the Bedouin you are occupied with. On wadi rum revelation visits, i will be provided food unique Bedouin sustenance and on the off chance that you like, you can find out about Bedouin conventional methods for supervision ordinary life. This is still insufficient for you. To show you more about the critical boundary Bedouin life, i can organize home stay with families in Wadi rum desert. Those photos look amazing! I’ve spent an evening in the desert (outside Abu Dhabi) but didn’t get to spend the night. Definitely a bucket list item. It was hard to take a bad photo with such beautiful landscape! I bet your desert experience was pretty incredible too. This looks like a really fun thing to do, especially considering the fact that you actually get in touch with a completely different culture. I actually love the desert, but I never spent an entire night out there – it gets cold pretty fast. Still, the images and the whole adventure look great! I love the desert too, but your right that what made this such a incredible experience was the culture that was added to that. This would definitely be an incredible first desert experience! I love love LOVE Wadi rum and Jordan in general. My (half)sister is half Arabic herself and got married in 2017 to an Arab, and they got married in Amman (Thousand nights hotel on the rooftop, gorgeous place). Being in Jordan was absolutely amazing. I was there for the first time in 2015, then again in 2017 and for the last time in October 2018. In 2018 we went to Petra, the Dead Sea, Salt, Ma’in and Wadi Rum. We went on a Jeep ride through the desert and climbed a small mountain. It was absolutely amazing. I definitely recommend adding Ma’in and Salt to your bucket list. Ma’in is a natural hot spring. It’s boiling water coming out of the mountains and you just sit in it. It’s so refreshing and absolutely gorgeous. There is 3-4 parts where you can choose the warmth of the water (the 4th being a cave connected to number 3). The lowest one is the coldest and then there’s 2 steps up where it gets warmer. Inside the cave the water is still boiling, and some people come there all the time to “shower” in it. It’s amazing. If you ever get the chance to go to Salt in Jordan i reccomend you go to Restaurant Oriental and sit by the view and cliffs. They serve good food + there’s an amazing view. I love it. 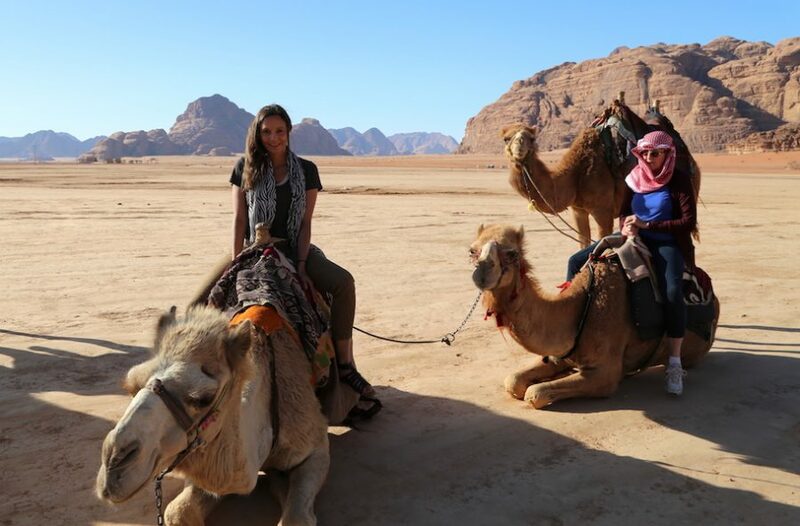 It sounds like you have had some amazing experiences in Jordan! Thank you for the recommendation, I will definitely be adding Ma’in and Salt to the bucket list.